Finding a lost sprinkler head can be a challenge, simple in concept but difficult if you don’t have a plan. Sprinkler heads can fail to rise to the occasion when under pressure. The longer they fail to operate the harder they may be to find. If available, look at the drawing used during the installation system, it may work as a road map in identify the general location. Look for an obvious brown/dry spot. Run the sprinkler, it may pop up but be clogged. If so, disassemble it, clean it, reassemble it, install it and you are done. If not, go to #3. If the entire zone appears to be weak, you may find water pooling. This could actually be a broken head or pipe as in this condition you are consuming way more water than the design. With the sprinklers running, look for mushy ground and water pooling. The head may be working, but it is too covered up to rise above the grass. Use a shovel to work the dirt (carefully). It may pop up once the dirt around it has been loosened up. Still no luck? 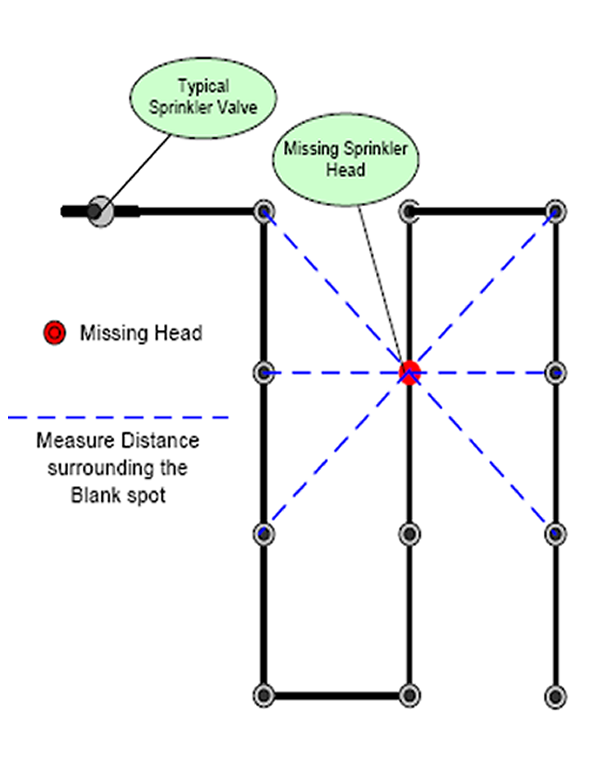 Using the same method described in Finding Leaks in Sprinkler Zones and Common Leaks. You will need to turn off all the heads in that zone. Let the water run, hopefully, it will show up since you are concentrating all the pressure to the missing head. Check your meter and look for moderate movement in the meter. If you have no movement in the meter the sprinkler head could be capped or not there at all. Still didn’t find it? You may not have a head there at all and the design just did not cover it well. So you may consider adding a head if the zone can accommodate the additional water use. You may also take a look at one of my other articles for help in the Lawn Sprinkler catagory. This entry was posted on Saturday, July 18th, 2009 at 7:07 pm and is filed under Conserve Water, Lawn Sprinklers. You can follow any responses to this entry through the RSS 2.0 feed. You can leave a response, or trackback from your own site.